Companies who have non-compete clauses drawn up assume they will always be enforceable, while people who are presented with them want to know whether or not they are bound by the terms. In certain situations, the answer to both of these questions is yes. Depending on the terms of the non-compete agreement, the courts in Florida may enforce its terms, and therefore you would be bound by its terms. If you haven’t heard the term, a non-compete agreement is just what it sounds like. It’s a clause in a contract, or a separate agreement, that an employee is bound by should they be terminated or choose to leave the company. The agreement is typically designed to keep them from taking business insights that they know from their old job and starting their own competing business or working for the competition. It may sound pretty straight-forward, but non-compete agreements are quite complex. And, choosing to draft one on your own or using a boilerplate template could result in the agreement not holding up in court should you need to enforce it. You should always have a Florida business law attorney draft any employment contracts, especially non-compete agreements. If you have hopes of drafting a legally binding non-compete agreement in Florida, you need to understand some of the key terms. One of the biggest mistakes people make with non-compete clauses is they are not reasonable. You cannot tell someone they cannot work for a competitor in the entire state of Florida for 10 years. The courts will say that your agreement is too long, or overbroad. The court could then opt to throw it out entirely or modify it. If you make the agreement more reasonable and to a much smaller time and geographical area, the courts will view your agreement in a different light. There is no specific formula as each case is different, but the courts generally look at non-compete agreements of less than six months to be reasonable and anything over two years as completely unreasonable. Another important element of a non-compete agreement is what you define as legitimate business interests. 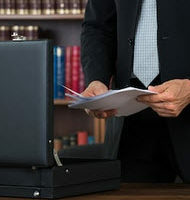 It’s understandable and within your rights to protect trade secrets and confidential business information. However, what you deem a trade secret and what the courts see are two different things. If you overreach here, the court will also likely throw the agreement out. Having a Florida business law attorney draft your agreement will reduce the risk that the court may not enforce your agreement. There are some positions that don’t make sense to have a non-compete agreement for either. Low level employees like a receptionist or clerical worker likely know very little under the categories that make up legitimate interest. If you try to force a non-compete clause against a receptionist, the court is likely to say there is no legitimate interest to enforce it and throw the agreement out. If your business involves health workers or people in specialized scientific positions, the court may say you cannot enforce your non-compete agreement if there is a shortage of workers in this area. You essentially can’t prevent someone from saving peoples’ lives.